SQL 2012 has 14 new functions, a new FileTable construct and new ways to sequence and fetch records - as this blog explains. 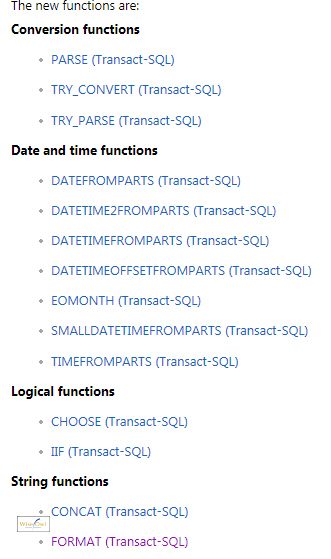 SQL Server 2012 has introduced 14 new functions (and added an extra argument to the LOG function). I've listed them, then given details and examples below. The new functions are shown on the left, with some examples given below. You can expand the categories, but none of the 14 new functions appear to show up. 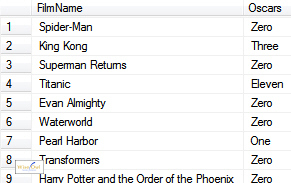 The selected column shows the date with the required format. Where has this function been for the last few years? SQL will never be the same again! The IIF function is well-known in Microsoft Access and Reporting Services (to name but two), and also in Excel (where it is known as IF). It allows you to write CASE statements more concisely. The first few films, with their lengths. Personally I've grown used to using CASE WHEN (and like the fact that it can be easily extended to cover multiple scenarios), but some other programmers might welcome the introduction of IIF. If a film wins zero Oscars, for example, then adding 1 to this gives the first item in the list: Zero. Each person has a lucky number entered - this should be as a number, but for Colin it isn't (it's text). Here Colin's lucky number failed to convert to an integer, so we display this as 0. It's up to you which method you prefer - I think I'll be sticking with the + symbol to concatenate for now. The SQL gives two dates as shown. I'll be using the TRY_CONVERT function and FORMAT functions extensively, but I'm not sure I'll be using many others.